TRANSCEND MEDIA SERVICE » The Guardian View on Israel’s Democracy: Killing with Impunity, Lying without Consequence? The late Amos Oz was right to say ‘even unavoidable occupation is a corrupting occupation’. Israeli voters should heed his words. 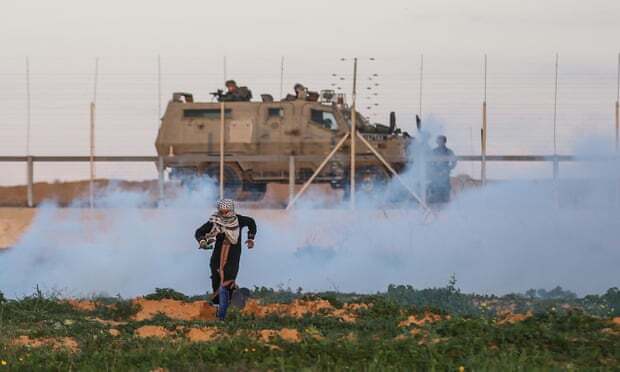 22 Jan 2019 – In the last nine months of 2018, according to the United Nations, Palestinians – many of them children – were killed at the rate of around one a day while taking part in protests along Israel’s perimeter fence with Gaza about their right to return to ancestral homes. They included medics and journalists. Most of the dead were unarmed and posed no danger to anyone, with little more than rocks in their hands and slogans on their lips. Yet Israel continued with an immoral and unlawful policy that sees soldiers of its military, which is under democratic civilian control, teargas, shoot and kill protesters, including those who pose no credible threat. The tensions between judicial and public opinion will be tested in the cauldron of Israel’s general election. Israel’s prime minister, Benjamin Netanyahu, unexpectedly called for early elections in December in what seems a transparent bid to head off possible corruption charges. The decision by Mr Netanyahu to dissolve the Knesset came days after the state prosecutor’s office recommended that Israel’s attorney general indict Mr Netanyahu on charges of bribery, which he denies. Mr Netanyahu is not only running for a fifth term in office, he is also running for his political life. His lawyers, it is reported, are arguing that a possible indictment be delayed; on the campaign trail Mr Netanyahu casts himself as an embattled leader persecuted by a leftwing elite comprised of lawyers, journalists and human-rights do-gooders. Echoing his friend Donald Trump, Mr Netanyahu has told reporters that Israel can choose its leadership only at the ballot box and not through legal investigations, which are a “witch-hunt”. Like the US president, the message from Mr Netanyahu is that democratic norms, those unwritten rules of toleration and restraint, are for the weak, not for the strong. Yet without robust norms, constitutional checks and balances are less mainstays of democracy than a mirage. The novelist Amos Oz’s words that “even unavoidable occupation is a corrupting occupation” have been ignored for too long. Mr Netanyahu’s nearest rival brags that he sent parts of Gaza “back to the stone age” when in the military. Mr Netanyahu would dismiss Oz’s warnings; but perhaps he ought to take heed of the recent spat between the historian Benny Morris and the writer Gideon Levy. The former, who made his name by lifting the veil on the ethnic cleansings on which Israel was founded, but drifted rightwards to say that these heinous crimes did not go far enough, and the latter, a leftwing columnist, agree that the two-state solution is a fading prospect. Mr Netanyahu lulls the public with the notion that a two-state solution will wait until Israel deems the conditions to be ripe. He hints that new friends in Washington, Riyadh and Abu Dhabi will come up with a proposal the Palestinians will swallow. This is pure cynicism. There is no new plan – just a rebranding of the status quo, maintained by force by Israel, and with Palestinians within and without Israel’s borders subjugated and dependent. Israelis must turn away from the occupation, which is debasing their society and suffocating the Palestinians. This article was amended on 25 January 2019 to refer expressly to teargas, and to omit a reference to shelling after the UN acknowledged error in its published material on which the reference to shelling had been based.